Disclosure: Thank you California Closets for sponsoring this post. Being a blogger and working from home is a blessing and a curse. While I’m incredibly grateful and honored to receive all the blogger mail so I can review all the latest and greatest beauty launches, having a beauty room is actually very stressful. Personally, I can’t concentrate on work and feel very anxious when the environment I’m working at is not organized. In order to avoid the cleaning anxiety, I spend a few hours every single week sorting the products, moving things around and trying to keep things neat. But I’ll be honest with you and say that regardless all of my effort and time commitment, my beauty room has never been completely organized. At some point, I started feeling that my weekly cleaning sessions are just a waste of time and I need to rethink the entire organizational system as opposed to weekly express cleaning sessions. 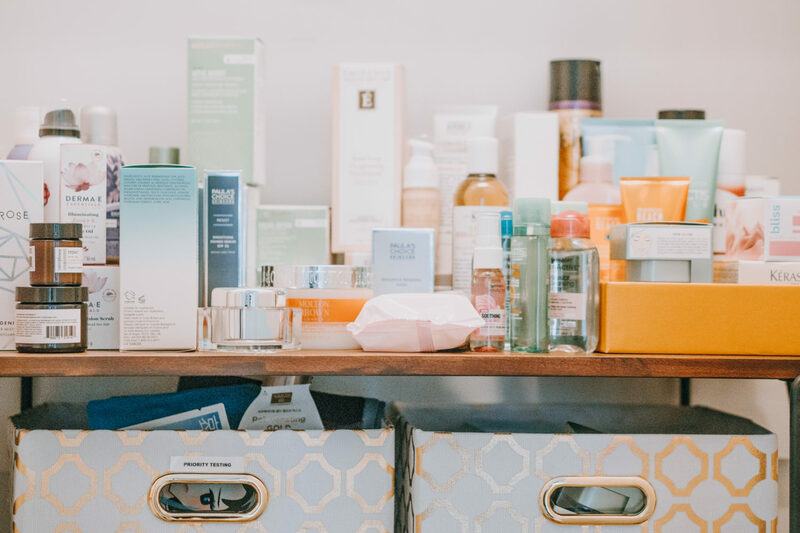 When California Closets reached out to me with an idea of re-organizing my beauty room using the Marie Kondo method, I was more than happy to do so. 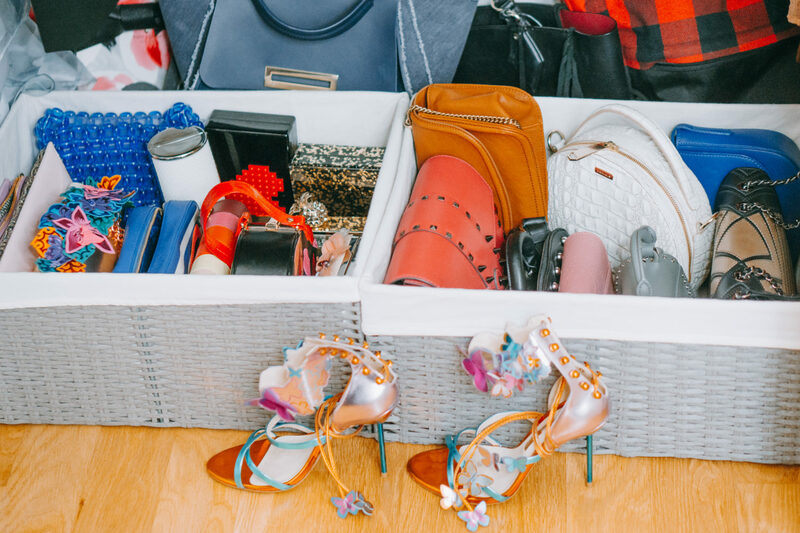 I read the book and already did the purge when it comes to my fashion closet, but I needed to do the same with all the beauty stuff and make my space for functional. In order to start my Marie Kondo style spring clean-up, I scheduled an at-home consultation with California Closets specialist from the nearest to my house location. I live on the Upper East Side in New York and one of their showrooms is located at 1625 York Avenue, NYC, literally in a walking distance from my house. The entire consultation with Peter (you can find him on Instagram at @closet_slayer), a designer I had a pleasure working with, took an hour. During this time, he measured two of the closets in my office that I planned on re-organizing, analyzed the type of items I’m planning on storing in each closet, created a 3D model of each design, and answered every single question I had about the renovation. Below, I provide my entire thought process on how I wanted to re-organize my closet in order to make it more functional. In case you are not familiar with the Marie Kondo method (it’s also known as KonMari method), I mention multiple times in this blog post, the gist of this organizational strategy is to only keep things that you use and love and minimize all the clutter and unnecessary things that don’t bring you joy. The Life-Changing Magic of Tidying Up, a best-selling book by Marie Kondo has a cult status as many people from across the world were able to turn their homes into more organized and functional spaces. The Marie Kondo organization concept works perfectly with California Closets’ mission statement. In case you are not familiar, this world-renowned brand offers customized closet solutions that help to organize your storage space and turn it into a functional and beautiful space. 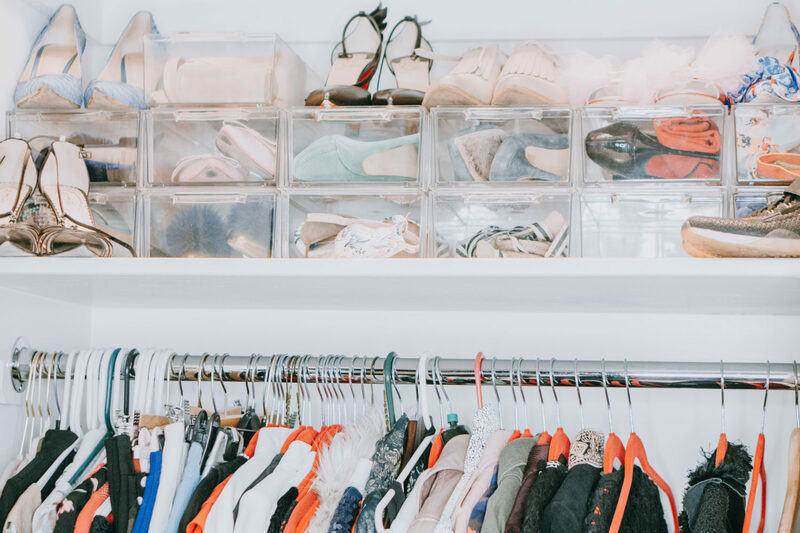 Think of any obsession-worthy closet you’ve seen on the internet or social—it’s most likely a California Closets design! Okay, without further delay let’s get into how I exactly I decided to re-organize two of my closets, with the help of California Closets! As I mentioned before, I had two in-built closets that I wanted to be reorganized. The first one (let’s call it a fashion closet) has been already sorted out before I had a consultation with Peter. I had two dozen bags of clothes, shoes, and accessories donated to the charity just a few weeks before so at this point, I already had a clear vision of how much space I need for each category. Current situation: most of my heels do not fit into clear plastic containers and I need to use a step stool to reach the top shelf. As you see in “before” photo, previously I stored some of my shoes in plastic containers that at the beginning of my cleaning process seemed like a great idea but it didn’t quite work for me. These clear boxes happened to be too small to fit the majority of my heels and sneakers, so I ended up only storing my sandals in them and putting my boots and taller shoes on top—which didn’t look cute at all. I wanted to have a sturdy shoe rack in my closet that allows me to display shoes in a way where I can see every pair. Keeping into consideration that my fashion closet wasn’t too big to start with; Peter and I were able to allocate the space for 22 pairs of shoes. After my first clean-up using Marie Kondo method, I still had about 30 pairs left so I have to minimize my collection even further. As you see in the 3D model, some shelves were designed taller than others, so I can fit boots, booties, heels, and flats accordingly. Current situation: while I purged a lot of clothes, I still need a solution to separate my clothes into different categories. Another organizational idea I was super happy about is to divide my clothes into three categories. 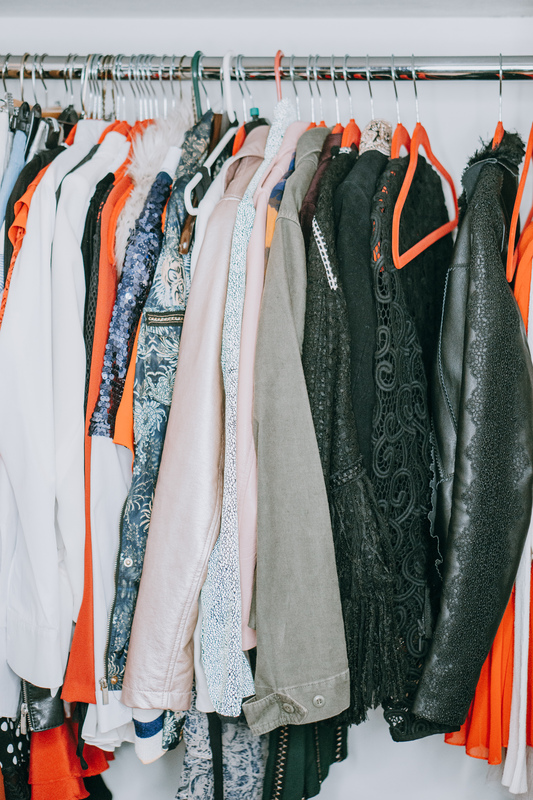 I attempted doing it with my closet before, but over time things kept mixing together and I was never able to find anything, even after I got rid of so many clothes. Our idea was to assign 3 spaces for my clothes: 1 for tops, 1 for pants and skirts, and 1 for dresses. That way, I could separate my clothes into categories and make it easier for myself to put together an outfit. Next time I have just another “I have nothing to wear” situation, I’ll just grab something from the tops and something from the bottoms areas and here comes the outfit. Current situation: all of my bags don’t fit into my baskets so I need a more convenient and elegant solution. As you see in the “before” photo, handbags were the most disorganized area in my closet. Previously, I attempted on having my bags stored in bins, but since these were covered with clothes and I couldn’t see which bag I’m grabbing, this area ended up being a mess at all times. I needed the solution where I can see all the bags I have. Peter and I agreed that we need to display bags on the shelves, so I can see which bags I have on rotation at the moment. I dedicated the middle shelf in my shoe display for bags as it would be the easiest to reach spot in the entire closet. I also love how it visually breaks out the shoe display and adds a bit more diversity to the closet organization. This one shelf would not be enough though to display bigger bags like totes and backpacks, so we decided to store the rest of my bags on top of the closet. I don’t reach out to these that often, so it totally makes sense to keep them away. I have a small ladder in my room anyways, so I can use it to reach the top shelf when needed. This closet was much easier to design because I had a specific idea in mind on how I want my beauty goodies to be displayed. Basically, the idea was to have two separate areas in the closet with as many shelves as we can allocate. The drawers are for makeup and shelves are for skincare and haircare products. Current situation: Skincare and makeup aside, I need to find a new storage space for my growing fragrance collection. I already have a jewelry closet and a bunch of clear plastic displays in my room that I use to store makeup but keeping my beauty products all over the room is inconvenient and confusing. My idea for this closet was to create just one area where I store all of my makeup (except display items that I will continue keeping clear plastic displays near the mirror). I figured that the best way to store these is by placing these items in drawers and having separators inside of them to avoid product movement while opening. • The biggest one is eyeshadow palettes—I have quite a big collection, and these take too much space in my other shelf, so it makes sense to keep them nice and neat in one big drawer. • The 2 big drawers are for the complexion items—foundations, primers, powders and setting sprays. • Another big draw is for some of eyeshadow and face palettes, together with single eyeshadows. • The 2 medium drawers are for brushes, bronzer, and highlighters. When it comes to skincare and haircare goodies, I prefer organizing these items by product categories: cleansers, toners, serums, eye creams, etc. As you see in the “before” photo, I started using a label maker in order to organize my products and I’ll continue doing the same once my California Closets system is installed. Having many smaller shelves that Peter and I are planned, gives me more options for categorizing my products. For instance, I no longer need to display hair sprays and dry shampoos on the same shelf simply because these bottles are of the same height—I can have a separate shelf for each product category. Current situation: Storage bins that I use for skincare items are always overpacked and it’s hard to find the item I need. Hair products (on the left and right from the makeup drawers): Hair Sprays, Dry Shampoos, Texturizers, Shampoos, Conditioners, Hair Masks, Hair Styling Products (oils, mousse, etc. ), and Hair Styling Tools & Brushes. Skincare section: Cleansers, Toners, Serums, Eye Creams, Moisturizers, Sunscreens, Masks – hydrating, Masks – detoxifying, Peels & Exfoliants, Makeup Removers, Body Care, and Treatments. 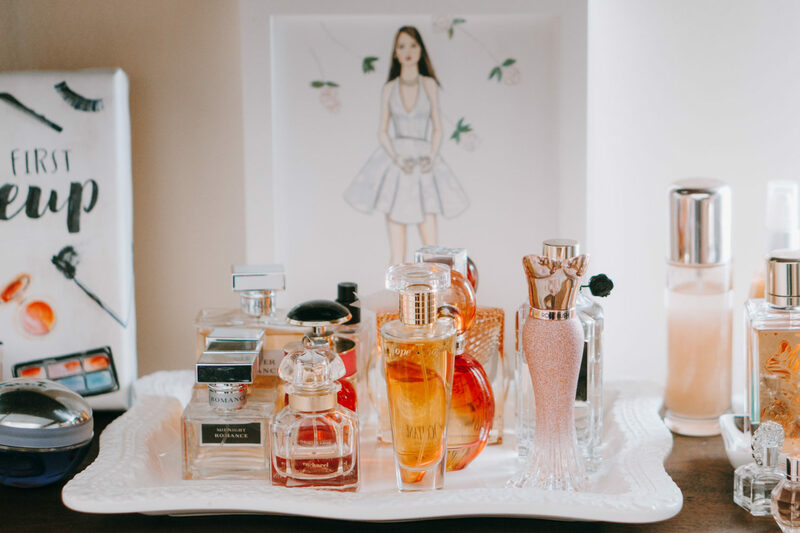 As you might have noticed, I don’t have any nail polishes or things like lip liners and lipsticks stored in this closet – I have a separate space in my beauty room dedicated to these items. That was quite a long and detailed post, wasn’t it? I hope you enjoyed me taking you behind the scenes of my beauty room organization and found some ideas on how to organize your beauty and makeup collections. I look forward to sharing photos on how my closets look like after the renovation. As per my conversation with California Closets representatives, it takes a few weeks to produce a custom-made closet design. When it comes to installing the system, it’s a few hours of prep work (de-installation of your old closet and re-painting) and one day of installing the system. Personally, I was surprised that such major redesigning project takes such little time—which is actually super handy. While we all love being organized, who has the time for home projects that take forever? I wonder if you had the time to check out California Closets designs yourself? It was my first time talking to them and I was amazed by the level of customer service they provided. I’m super excited to see how my final project comes out! Who wants to see my beauty room re-decoration results?